HARARE: Pakistan hard-hitting left-handed opener Fakhar Zaman broke another record as he became the fastest batsman to get to 1000 ODI runs, reaching the milestone in just 18 innings. Zaman needed 20 runs to break this record-earlier held by Sir Vivian Richards- in the fifth One Day International (ODI) against Zimbabwe. Kevin Peterson, Babar Azam, Q de Kock, Sir Vivian Richards and Trott reached there in 21 innings. 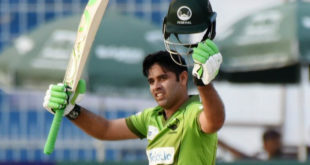 Furthermore, Zaman also became the highest run scorer in a five-match ODI series. Pakistan Cricket Board (PCB) praised the batsman tweeting: “Congratulations @FakharZamanLive on creating another record! Fastest to reach 1000 runs in ODI Cricket”. Congratulations @FakharZamanLive on creating another record! Furthermore, International Cricket Council (ICC) also congratulated Pakistani batsman: “Congratulations to @FakharZamanLive! @TheRealPCB opener becomes the fastest batsman to get to 1000 ODI runs, reaching the milestone in just 18 innings! Congratulations to @FakharZamanLive! @TheRealPCB opener becomes the fastest batsman to get to 1000 ODI runs, reaching the milestone in just 18 innings! In 4th match, Fakhar Zaman became the first Pakistan player to hit a double century in one-day internationals, racing to 210 not out in the fourth ODI against Zimbabwe on Friday. The southpaw – who remained unbeaten on 210 – became the sixth cricketer to smack an ODI double century. This was also Zaman’s second triple-figure score of the series. In his four innings, Zaman is yet to be dismissed in this series and has already amassed a total of 430 runs.